Follow through day in the works? In typical bi-polar nature the market has completely reversed yesterday’s losses and then some as all three broad market indexes jumped back above their 50dma. While it is still early in the day, the move has the potential to turn into a follow through day for the S&P500 and Dow if we continue higher and the volume kicks in this afternoon. The NASDAQ undercut its recent low yesterday, resetting its follow through day count and is currently the lagging index as traders appear to be rotating out of first quarter’s hot tech stocks. Demoralizing sell-off yesterday, euphoric rally today, maddening isn’t it? But if the market was easy, everyone would be rich and we all know it doesn’t work that way. Currently the market is doing its best to embarrass and humiliate both bulls and bears, and all this back and forth action looks like it is doing a good job of it. One day the market is spooking weak holders and tempting premature shorts and the next it has the buy-the-dip crowd rushing in with open arms and shorts running for cover. And within a couple days both sides have been bloodied and regretting their hasty trades. So what can we make of this price action? 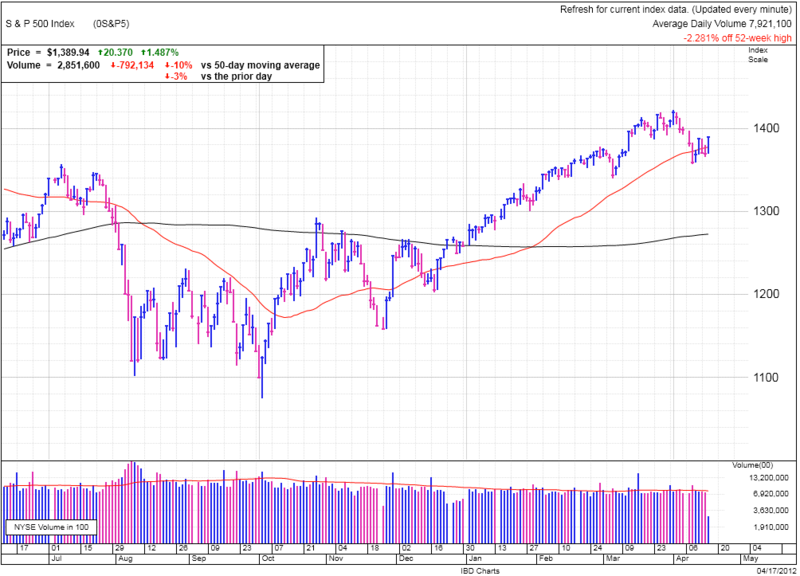 On the positive, we continue to find support at the 50dma and are holding the recent consolidation area. We have also been able to avoid a cascade of panic selling and so far most sell-offs have been been blunted by the buy-the-dip crowd. For the negative, volume has been low, showing a lack of conviction and each rally is missing follow through buying and has reversed. In addition, it seems like we lost the leadership of the tech sector and laggard industries are leading the S&P and Dow moves higher. Can these lagging sectors really sustain a move higher? But as I mentioned, we continue to hang around the 50dma and it will take a decisive break away from this to establish the next trend and that is what we need to keep an eye out for. Further gains on substantial volume today would be a signal to start venturing back in. But without that clear-cut signal, it is best to continue waiting for a confirmation because without conviction behind today’s rally, we could easily continue this bi-polar nature and see a pullback reversing all these impressive gains later in the week. If we do see a follow-through today, the real challenge we be sifting through the rubble to find leading stocks that had a healthy pullback and filtering out those that appear broken. AAPL’s earnings release next week will also be a big catalyst for the market and tech stocks since it has been the general leading the charge higher over the last several months. A sneeze by AAPL could give the entire market a cold. But at the same time, another blow out quarter could reignite the tech rally. Given the recent price run, simply meeting expectations will probably disappoint the market and we’ll fee the heavy burden of the recent rally.